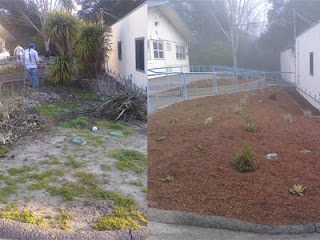 In January, Evergreen worked hard to bring a beautiful environment to a local school. As a small business developed by the Chavez Center, work in the community such as this gets at the heart of what this social endeavor is all about. 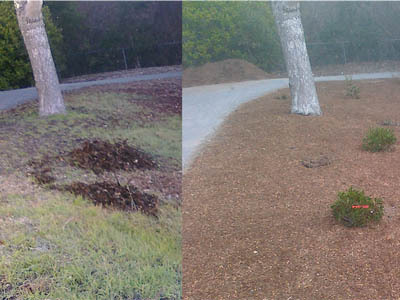 Evergreen Cooperative finished their first landscape project of 2011 at Del Rey Elementary School in Orinda. Four cooperative members worked over eighty hours to convert a scrub filled landscape into a beautifully landscaped slope with drip irrigation and low maintenance plants. Under the generous guidance of Ben Contreras, a landscape contractor with over 30 years of experience, this project not only created an esthetically pleasing environment for the students but also provided the members with valuable training in completing a project from start to finish. If you have any landscaping needs, contact Evergreen today at 925-808-7865 or visit them online at www.eastbayevergreen.com. Evergreen Cooperativa terminó su primer proyecto de paisaje de 2011 en la escuela de Orinda, Del Rey Elementary. Cuatro miembros de las cooperativas trabajaron más de ochenta horas para convertir un jardín llena de matorral en una pendiente ajardinada con riego por goteo y las plantas de bajo mantenimiento. Bajo la tutela de Ben Contreras, un contratista del paisaje con más de 30 años de experiencia, este proyecto no sólo se crea un ambiente agradable estéticamente para los estudiantes sino que también proporcionó a los miembros con una valiosa formación en la realización de un proyecto desde principio a fin. Si usted tiene alguna necesidad de jardinería, póngase en contacto hoy con Evergreen en 925-808-7865 o visítelos en línea en www.eastbayevergreen.com. A small business if it is done with consistent hard work will become a big business. The Evergreen Cooperative's effort is highly appreciative and need more support and encouragement.